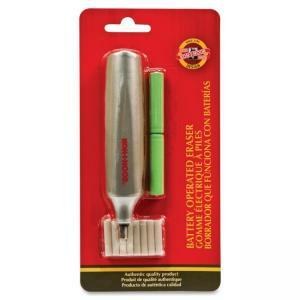 Economical handheld eraser erases completely and operates with the simple push of a button. Sleek, lightweight design offers precise control. This cordless battery-powered eraser is perfect for erasing large areas, cleaning up a drawing or creating special effects. Eraser includes two AAA batteries and eight graphite eraser refills (latex-free).